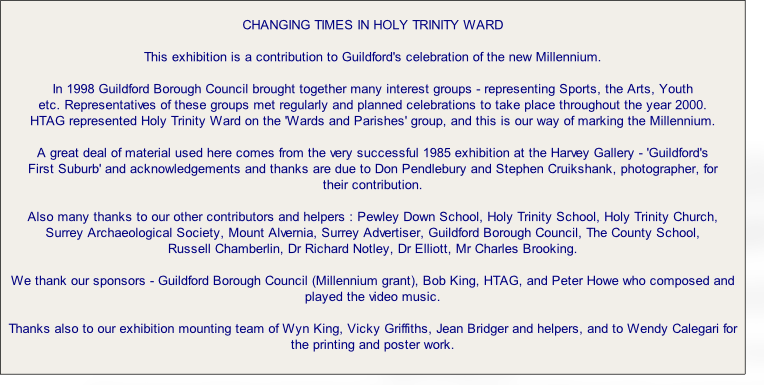 This part of our website commemorates the exhibition arranged by Holy Trinity Amenity Group and held at the Harvey Road Gallery to celebrate the Millennium. The exhibition materials are stored at Guildford Museum but we took the opportunity to scan them while they were on display at the Residents Luncheon in 2008. Thanks are given to Jean and Gordon Bridger, Stephen Wright and Holy Trinity Amenity Group for allowing us to display them on this site. As these pictures were collected more than eight years ago copyright for many of them is unknown. We would like to acknowledge copyright of these photographs and would ask anyone with claim to this right to contact us, 01483 598 420. We have generally left the text from the exhibition un-edited but have on some occasions added comments in turquoise to bring history up to date or to add new information.